The standard Android and iOS messaging apps—you know, the app you use for trading all those text messages, photos and videos—can do much more than you might think. 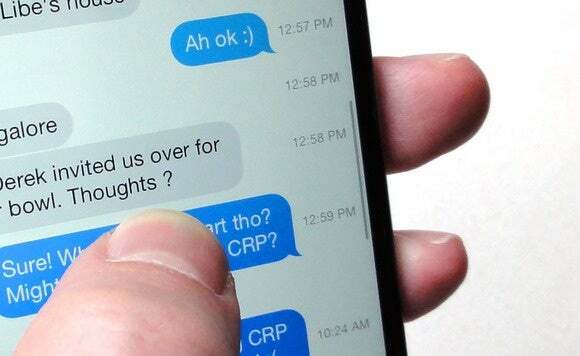 Not only can you forward any text messages you receive, you can also (depending on whether you're using an iPhone or Android phone) find out when a given message was sent or received, shush an annoying group thread, or "lock" a message that's particularly important. 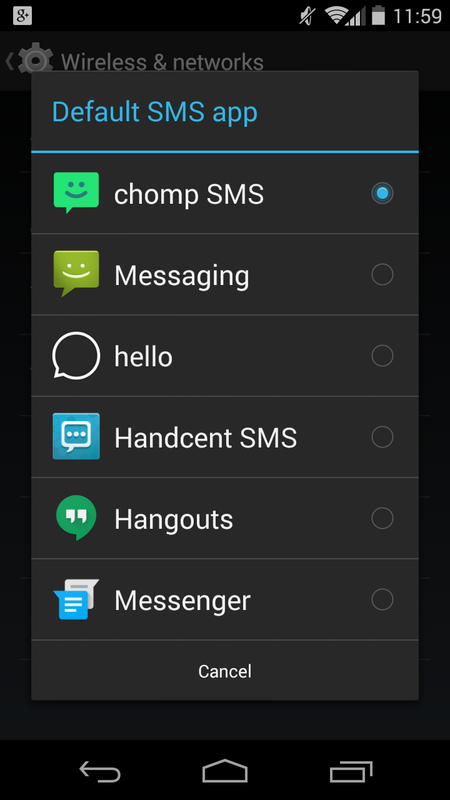 You can even swap in a whole new messaging app if you're not satisfied with the "stock" one. Want to shush an annoying group thread? 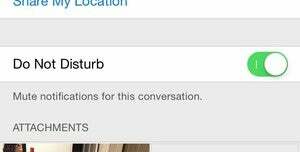 Open the message thread, tap Details, then flip the Do Not Disturb switch. Sounds simple, but forwarding a text or picture message to someone else on an iOS or Android device isn't easy if you've never done it before. In the name of creating the flattest, most Spartan interface possible, the messaging apps for both iOS and Android hide the forward controls behind a few touch gestures. For Android: Tap and hold the message you want to forward, then tap the Forward button. The text of the message will then be pasted into a new message that you can address to anyone you like. For iOS: Tap and hold the message you'd like to forward; when you do, a pop-up with a few different buttons (such as "Copy" and "Speak") will appear. Tap the More button, then tap the little forward-arrow in the bottom-right corner of the screen. Got iOS? Tap and hold a message, then drag it from right to left to reveal its time stamp. 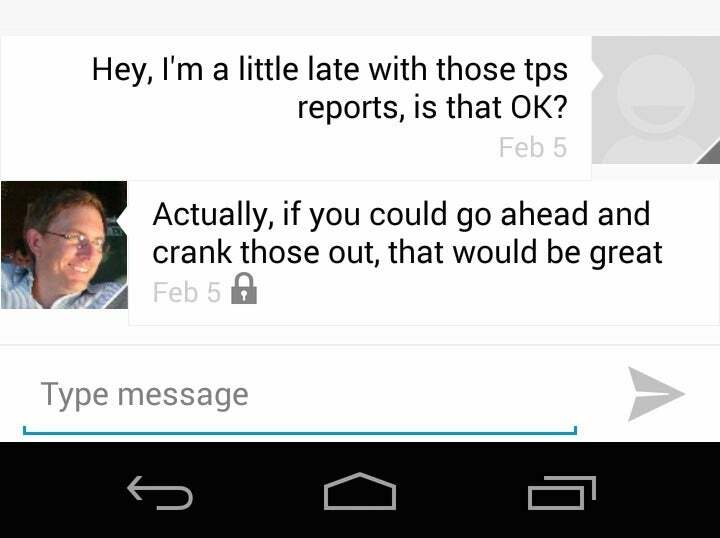 The Android messaging app does a nice job of time-stamping each text message within a thread; iOS, not so much. Sure, you'll see a date and time stamp marking each individual burst of text messages in a thread, but nothing for each individual message—that is, unless you know this particular little trick. For iOS: Tap and hold a text message, then pull it gently from right to left; when you do, you'll reveal a column of time stamps on the right. For Android: Yes, Android text messages are already time-stamped, but you can still pull up precise info on when an individual message was sent, and to whom. Just tap and hold the message, then tap Details. Ever get stuck on a group text-messaging thread that just won't stop? If you've got an iPhone or iPad running on iOS 8, there's an easy way to shush the chatter. 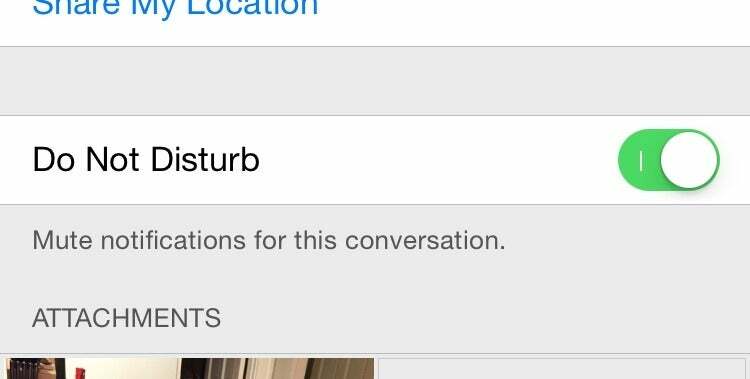 Open the group thread that's bugging you, tap the Details button in the top corner, scroll down and flip the Do Not Disturb switch. An individual text message takes up a miniscule amount of data on your phone, but eventually, all little messages will start to add up—particularly if there are pictures or video clips attached. 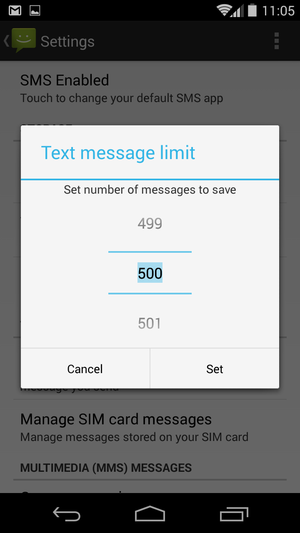 Your Android phone can delete old text and pictures messages automatically with the right setting enabled. Luckily, both the iOS and Android messaging apps have a handy setting that'll trash older text and picture messages automatically, perfect for keeping your phone's storage from getting junked up with ancient SMS threads. 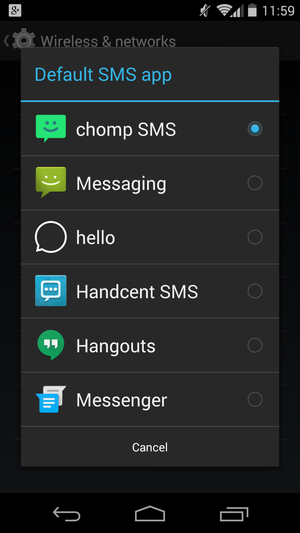 ● Open the Messaging app, tap the three-dot menu in the top corner of the screen, then tap Settings. ● Scroll down to the Storage section and make sure the Delete old messages setting is checked. 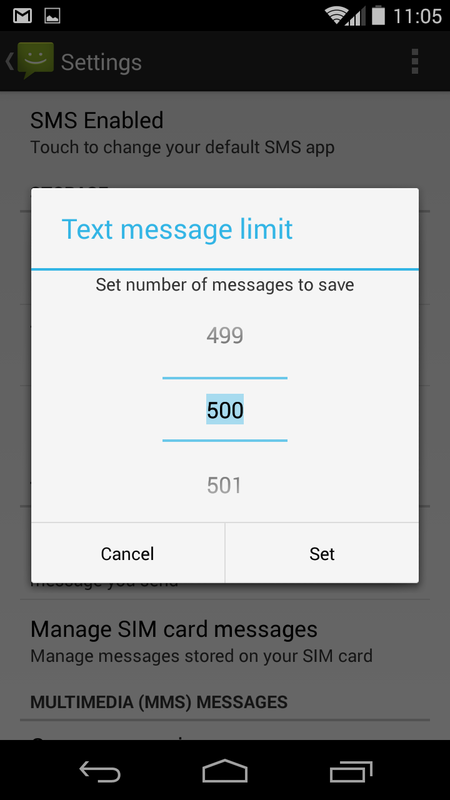 ● Tap Text message limit, choose the maximum number of messages that can sit in a messaging thread before the olders ones get deleted, then tap the Set button. ● Last but not least, tap Multimedia message limit and follow the same process. Because picture and video messages consume far more storage than a text message does (think a megabyte or two rather that just a few tiny kilobytes), you'll want to pick a lower number—somewhere in the 50-100 range. ● Tap Settings, Messages, then scroll down and tap Keep Messages (under the Message History heading). ● Go ahead and decide how long you'd like to keep old text messages before they're deleted: for 30 days, a whole year, or forever and ever. In case you're wondering, no—there aren't any custom settings. Old text messages that delete themselves automatically? Sounds like a great idea—until an essential message disappears in a puff of smoke. Just "lock" any important message you want to keep so you won't delete it by accident. 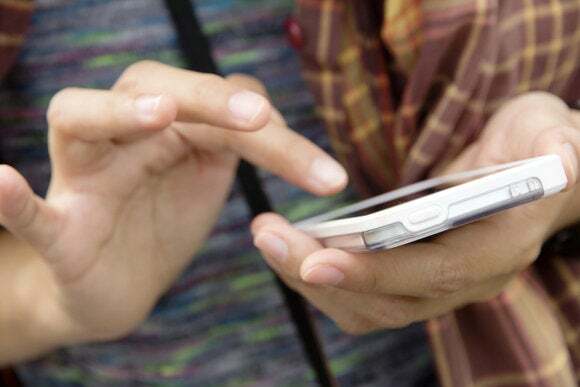 If there's a particular text message you need to keep no matter what, you can "lock" it in your Android phone's memory, perfect for protecting it from the "Delete old messages" setting. Just tap and hold the message, then tap Lock. A little padlock icon will appear on the protected message. The latest version of Messages for iOS lets you view all the photos and video clips in a given message thread at once. A huge message thread with a loved one is likely riddled with pictures and video clips from days, weeks, or even months ago, making it quite a challenge to scroll all the way back in search of a specific snapshot. The good news, though, is that the latest version of the Messages for iOS lets you view all the photos and video clips in a given message thread all at once. Open a thread, then tap the Details button in the top corner of the screen. 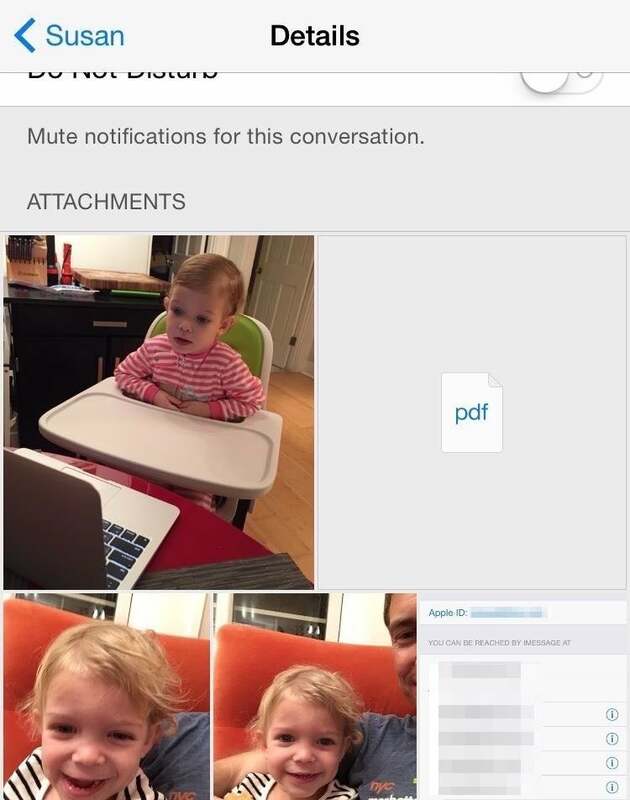 Scroll down to the Attachments section, and there you go: Every picture, video clip, sound file, or any other attachment you've traded with a fellow texter will be right there, ready to be saved, forwarded, printed, or simply opened. The only thing you can't do with the files in the Attachments section is select them all at once—or batch-delete them (or delete them at all, actually). An annoying omission, no question. Android users can pick from dozens of interesting first- and third-party messaging apps. Not satisfied with the "stock" Android texting app? If you've got an Android phone, you can take your pick from dozens of interesting first- and third-party messaging apps, from Google's Hangouts and flashy new Messenger app to Facebook Messenger, the wildly popular WhatsApp, Viber, Chomp (which lets you schedule text messages for later sending), and many more. The first step: download and install a new messaging app from the Google Play Store. Once that's done, tap Settings, More (under the Wireless & Networks heading), Default SMS app, then select a new app from the list. All set? Now you can use the app you just picked for all your messaging needs, including garden-variety SMS and picture messages. And in case you're wondering, yes—your new messaging app will (or should, anyway) import all your old message threads.